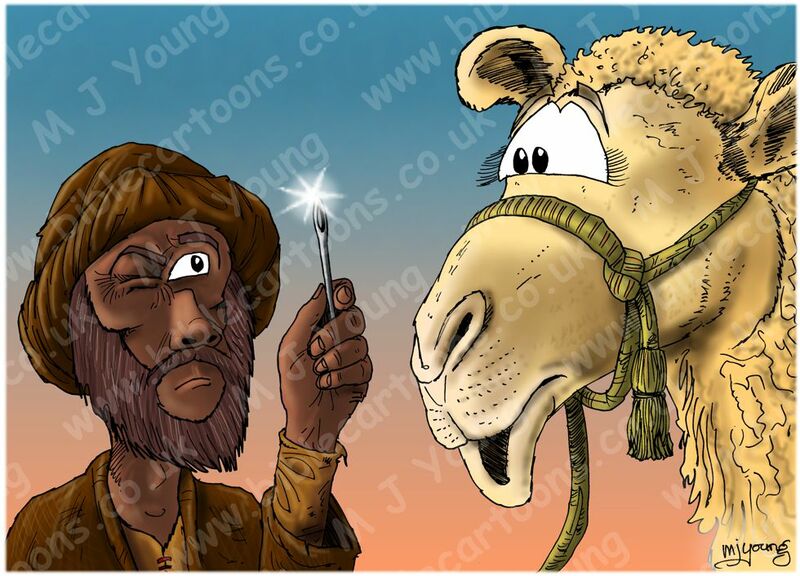 Bible Cartoons: Camel, needle and Jesus - what’s most important to us? “When Jesus told the disciples that it is hard… for the rich to enter God’s kingdom, they were amazed (Greek, ethambounto, “surprised”; cf. 1:27; 10:32) because in Judaism riches were a mark of God’s favour and thus an advantage, not a barrier, in relation to God’s kingdom. Only in the Synoptic Gospels (Matthew, Mark and Luke) did Jesus address the Twelve as children (cf. John 13:33 ), reflecting their spiritual immaturity. In light of their surprise Jesus repeated and clarified His original statement. If the words “for those who trust in riches” (NIV marg.) are omitted, Mark 10:24 (which is unique to Mark) applies to everybody who is confronted with the demands of God’s kingdom. If included, they explain the rich man’s difficulty and expose the danger of trusting in riches. The humorous comparison (v. 25) employs a memorable Jewish proverb to depict the impossible. It is easier by comparison for a camel, the largest animal in Palestine at that time, to go through the eye of a common sewing needle (the smallest opening) than for a rich man who trusts in his riches to enter God’s kingdom. So it seems that wealth, of itself, may be THE barrier to us gaining eternal life, in an individual person’s case where wealth is our idol or god. Of course there may be some other idol in our lives which acts as a barrier to us gaining eternal life. I guess we would have to consider what is most important to us, individually, in order to figure out what that particular thing is. No doubt it would relate to what we cherish most and hold most dear, over and above the Lord Jesus Christ. Having cherished possessions; important people in our lives; etc is not a problem, UNLESS they are higher in our esteem than Jesus is… then they ARE a barrier to us wholeheartedly devoting ourselves to Him and His kingdom. The question is: what is central and of most importance to us, we have a very real problem if ANY THING or ANYONE is more important or more central to our security and significance than Jesus is. 33 Dear children, how brief are these moments before I must go away and leave you! Then, though you search for me, you cannot come to me—just as I told the Jewish leaders. 8 God saved you by his special favour when you believed. And you can’t take credit for this; it is a gift from God. 9 Salvation is not a reward for the good things we have done, so none of us can boast about it. 10 For we are God’s masterpiece. He has created us anew in Christ Jesus, so that we can do the good things he planned for us long ago.